Today’s story is for those who still have some doubts about the magic check. The magic check works in mysterious ways, you just have to have faith in it. You will receive the money from unexpected sources. I have suffered for many years with depression and have periodically used The Secret. I bought The Magic book over a year ago but never really had time to read and practice it properly. My life has been plagued with debt and sadness but 3 weeks ago I found The Magic book while searching for something and decided to give it another go. 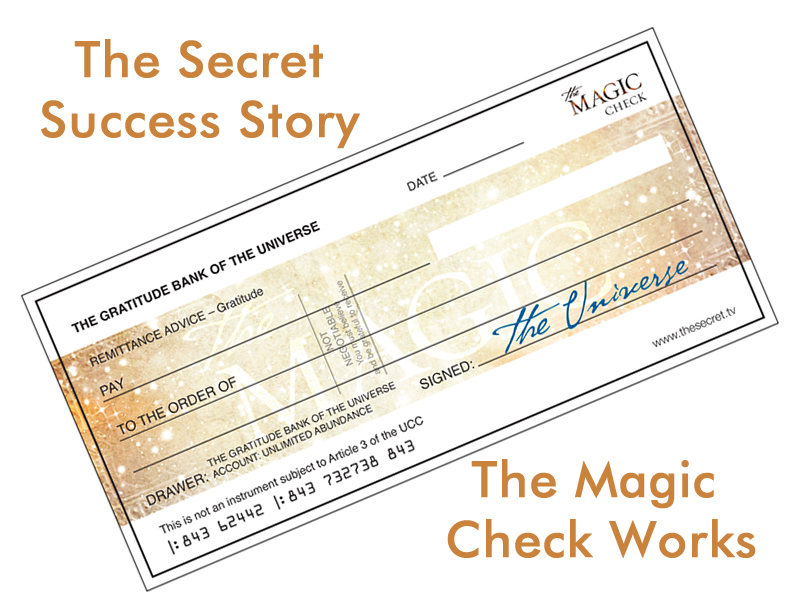 When I got to day 17, I printed off The Magic Check and wrote it out for £800. I thanked the universe for my £800 and all day looked at it and thanked the universe for the money and what I would spend it on. The next day I went on holiday with my family and thanked the universe for all the spending money I had to spend on holiday, even though we only had a little to spend. When I got up and checked my emails on the Saturday, 2 days later, I had received an email from my electric provider telling me I was in credit by £1256.00!! I rang the company and after adjusting my account, the actual amount to be refunded was £880!!!!! My husband was skeptical about The Secret but is now a true believer and needless to say we had the best holiday ever!! Thank you, thank you, thank you Rhonda for sharing The Secret. About the Author: I am a mother of 2 beautiful and gifted children who married her soulmate.